Words from the heart, and sometimes the brain. : What do the modern day bride & groom REALLY want as a wedding gift? What do the modern day bride & groom REALLY want as a wedding gift? People are asking us what we want as wedding gifts and it's sort of hard to answer. See, we've been living together for the last six years and have all the household stuff we could ever need, so it's not like a set of fine bone china will cut it (although I would feel really fancy about that). I think in this day and age this is the case for a lot of couples, definitely couples our age anyway. So we've just been asking for money, which admittedly feels a tad strange, but that's a surefire way to ensure we can get the things we really want, the things we can't put on a gift registry. It got me to thinking what do I REALLY want, like, as a super cool treat for myself. I asked my fiance too and we came up with a few ideas. At age 37 I'm sad to say I've never gotten round to owning a stainless steel egg slicer. 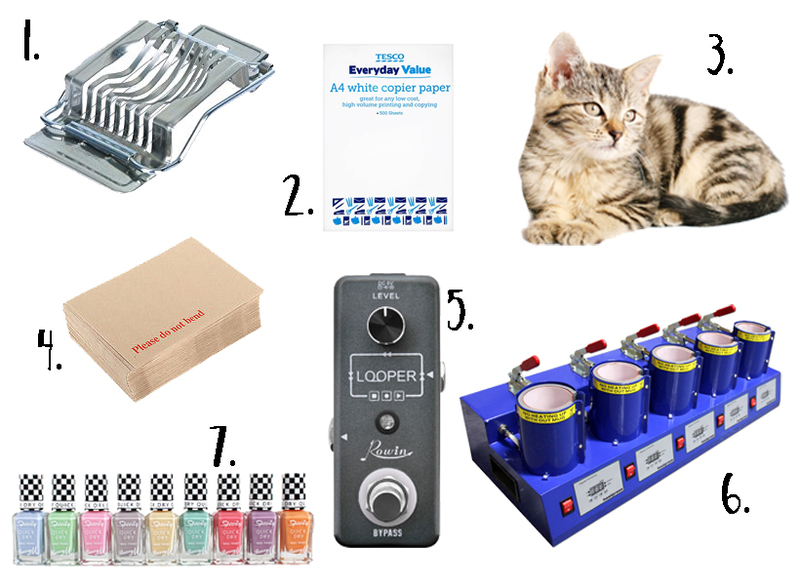 So here's a few (mostly mine) of the things that we'd really love to purchase with our wedding pennies. 1. That egg slicer. We used to have one of these when I was a nipper and I remember being fascinated with it. Not only does it slice eggs to perfection, I spent many a happy time strumming little tunes on the strings! 2. Paper. Now this is a pretty run of the mill item yes? Well NO, actually. If I run out of paper round here then I've pretty much had it shop-wise. My other half asked me once what I wanted for an upcoming birthday, paper I said. He knows me well enough to not question it, so he got me a ream and wrapped it up all nice. 3. Cat(s). Always room for more fur babies, no more explanation required. 4. Envelopes. Same rationale as paper. 5. This one is Pete's. Some sort of pedal thingyo for his guitar. 6. This little badboy makes my mouth water. Mugs have now become the backbone of my little biz and I do worry what I'll do if something ever happens to my current mug press. So this 5 in 1 powerhouse is my dream wedding gift. (I may have to have a word with Father Christmas if we don't get a fat enough wad). 7. You'll never catch me without my nails done. I've said this many times before but I may have a hairdo like Worzel Gummidge and an outfit that looks like I've slept in it but my nails will always be tarted up. My varnish of choice is Barry M, so anything from there and I'm made up! I'd love to know what unconventional items you bought with your wedding wad, or did you have the balls to put it all on a gift registry?